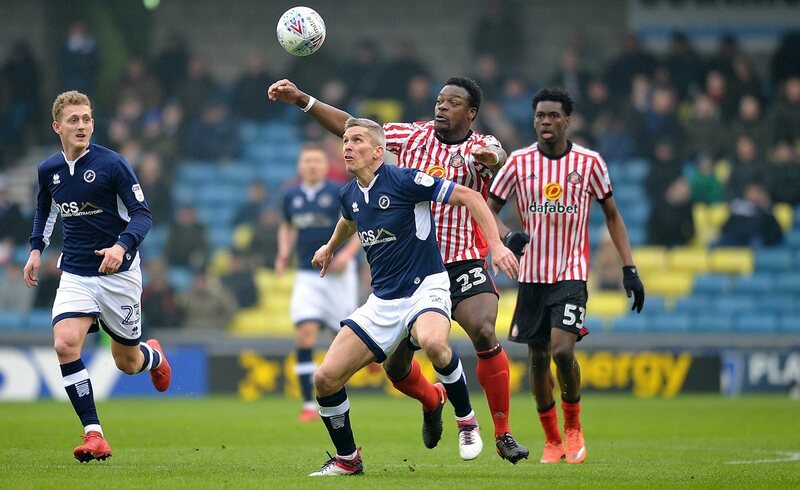 Millwall failed to beat Sunderland at the New den as only a Shaun Hutchinson strike twenty minutes from the end saved the south Londoners from defeat against the bottom side in the league as they drew 1-1 on a freezing Saturday afternoon in March. All Championship games had been called off due to the adverse weather conditions around the country however Millwall’s match survived the big freeze on an afternoon they probably wish their game had been postponed too. Unused to having so much of the ball in possession the Lions failed to break through the Sunderland defence for large swathes of the game despite having a whopping 15 shots on the Black Cats goal. 7 of those shots were on target as opposed to Sunderland having the single shot from which Bryan Oviedo notched the opener for the away team. The Black Cats went into the game five points adrift of safety at the foot of the table, but while Millwall had won their previous three games on the spin, it was the visitors who were the more composed side for much of the opening 45 minutes. The Lion’s usual tactic was to hoof long balls towards their strike pairing of Lee Gregory and Steve Morison which has worked wonderfully well for Millwall this season however Tyias Browning and John O’Shea were generally on hand to snuff out any danger for the Black Cats. 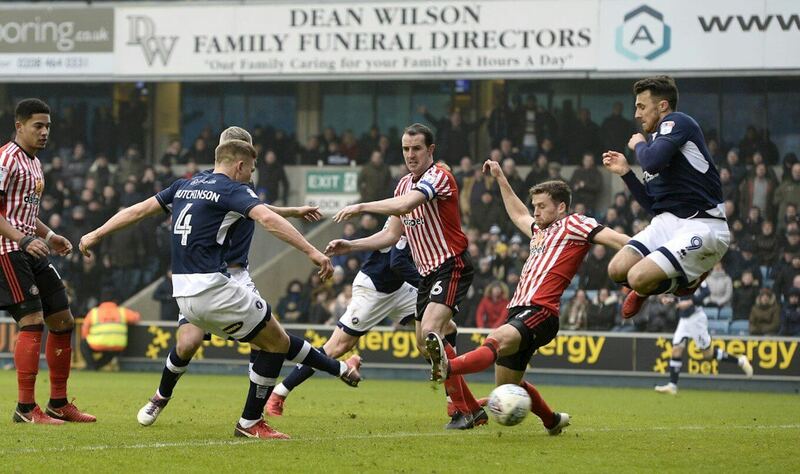 Millwall almost took a sixth minute lead when Jake Cooper found himself completely unmarked from a corner, but Lee Cattermole was able to hack away the defender’s goal bound header from a position on the goal line. Callum McManaman fired over when a corner was cleared into his direction midway through the first half, but the next time Sunderland tried their luck from distance four minutes later, the deadlock was broken. Bryan Oviedo played a cool one-two with McGeady from a short corner and moved infield towards the corner of the area. There appeared to be little danger when he took aim with his left foot, but he rifled a cracker of a strike that flew past an astounded Millwall goalkeeper Jordan Archer and found the top right-hand corner of the Millwall net. A spectacular goal that had the home fans stunned. Millwall’s players appeared shell shocked too by the concession, although Steele was forced to produce a decent save as he parried Shaun Williams’ low strike shortly before the break. Morison headed wide after Ben Marshall crossed from the right, but Sunderland made it to the interval with their lead intact. The Lions began the second half on the attack and Steele got down to claim Lee Gregory’s scuffed shot after the Black Cats defence struggled to clear a free kick. Sunderland then survived a penalty claim when Morison went down under a challenge from Ovie Ejaria, and Steele was called into action again shortly after, tipping Gregory’s looping header over the crossbar. Sunderland’s defenders failed to clear Marshall’s delivery, and while Cattermole tried to clear Shaun Hutchinson’s stabbed effort, referee Andy Davies ruled that the ball had crossed the line. “I thought we did enough to win, but that’s a good reality check for everyone associated with this football club. It showed that if we’re not at our best, we can come unstuck against anybody. With no other teams playing Millwall leaped a place to 11th while the result means the Black Cats remain at the foot of the table, and are now four points adrift of 21st placed Barnsley, having played a game more than the Tykes. ESPORTS – THE FUTURE OF BETTING?